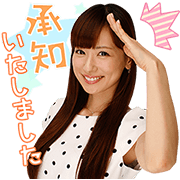 http://www.line-stickers.com/ – TV Anchorwomen: Talking Stickers Line Sticker | The beautiful and talented women of Cent Force are here to show off their newscasting skills with their very own set of talking stickers. These quippy quotes and adorable phrases are perfect for the office! The sound for these stickers will play on iPhones even if your device is set to silent mode.